This is a very flavorful, very Earthy cereal. Maybe I was in a particularly good mood, but as I ate a bowl at my desk, the flavor gave me a relaxed feeling... as if I were eating breakfast on the porch of a nice farmhouse. 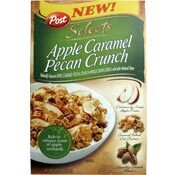 Apple Caramel Pecan Crunch consists of whole grain flakes, dried apple pieces, small pecan pieces and little "caramel baked oat clusters". This is a cereal where no spoonful is ever exactly the same. The apple pieces come into play every second or third spoonful. I found a sizable caramel cluster in every third or fourth bite. There's a good amount of pecan pieces and you get a couple in almost every bite. The dried apples make the biggest impact, which give this cereal its uniqueness. Many of the pieces are almost 3/4 of an inch long. I liked the fact that the dried apple pieces aren't uniformly incorporated into the cereal as smaller pieces would be. This every-other-bite approach is closer to the experience of adding fresh fruit to a bowl of cereal. I wish Post could have been a bit more bold with the caramel. While this cereal has an ever-present air of caramel, the flavor is somewhat muted. The caramel clusters don't EXPLODE with caramel flavor... they just sort of have a little caramel flavor. The consistency of the clusters are very similar in texture to cereal flakes, further reducing the effectiveness of the clusters. Overall, I liked this cereal despite my yearning for more caramel flavor. It tastes fresh and it's fun to eat. 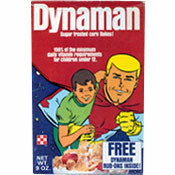 By the way, even if you're not the least bit interested in this cereal. Check it out in the cereal aisle. On the front of the box, there's a scratch and sniff area to "release the scent of apple orchards". That fragrance is VERY fresh. I dare say, a little fresher than the cereal inside the box. Nutritional concerns: Each 1 cup serving has 210 calories, 3.5 grams of total fat (0 grams trans and 0 grams saturated), 0 mg cholesterol, 41 grams of total carbs, 5 grams of dietary fiber, 10 grams of sugars and 4 grams of protein. What do you think of Apple Caramel Pecan Crunch? I need to know where to order this cereal. It is the best! Best cereal ever. I can't find it anywhere to order. I miss cereal sooo much. I enjoyed this cereal very much.